Tech is so much more fun when you're conjecturing about what might happen. Sonos is definitely launching an outdoor waterproof speaker, for your garden or patio: Sonos Outdoor by Sonance. That is fine (although we are not sure about the new brand name for Sonos' custom install speakers: Sonance, really?) But we had almost convinced ourselves Sonos was lining up a pair of headphones, which would have been a less obvious move and so much more exciting. The outdoor speaker (the one on the right in the Sonance group render image above) is built to withstand humidity, water, 'salt spray' (? ), extreme heat and cold, and ultra violet rays. As you would expect, really. It's part of the Sonos Architectural by Sonance range, all of which are designed to work with the Sonos Amp ($599/£599), although that – like Sonance's speakers – is US-only at present. You can now pre-order Sonos Amp in the UK, however. The Sonos Amp can supposedly power up to three pairs of speakers, although since it only has one pair of speaker outputs, we're not quite sure how. Even the outdoor Sonos speaker is actually a stereo pair, which is still slightly unusual. It's worth noting that these are passive speakers. All the Sonos functionality – AirPlay 2, Alexa control, 'TruPlay' room calibration, and streaming services from Apple Music to Spotify to Tidal and beyond, are driven by the Sonos Amp. Or, to put it another way, these are completely normal speakers, with nothing intrinsically 'Sonos' about them other than, of course, the brand's audio expertise. You can just as easily use any other third-party, passive speakers with the Amp. “Our goal was to create a solution optimised for installers, bringing the Sonos experience to architectural speakers for the first time,” exulted Sonos CEO Patrick Spence. Yeah, but what about the headphones, Patrick? What about the headphones? Given the nature of the British weather, we expect the Sonos In-Wall and In-Ceiling to be more sought after than the Outdoor. 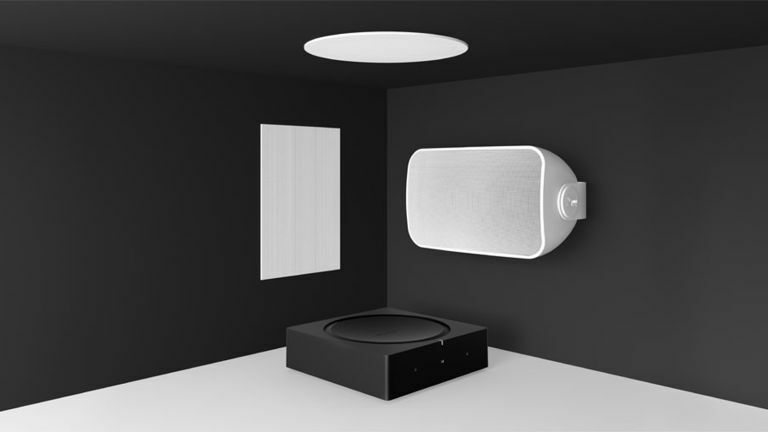 • Sonos Architectural by Sonance In-Wall and In-Ceiling speakers are $599/per pair, shipping February 26 in the USA. Sonos Outdoor are $799/pair), shipping in April. UK and worldwide pricing and availability are TBC.